My dog’s dental health is very important to me. Seriously, it should be for every pet owner. Could you imagine going around your whole life having never brushed, flossed or gargled? I can’t imagine getting started on my day without brushing my teeth. I’m always on the look out for the pet product that can help mitigate plaque, tartar and bad breath for both my cat and my dog. Problem is, most of these products are very expensive and not well favored by my pets. 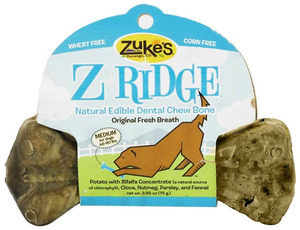 With that I went to Wiskers Holistic Pets in New York City (one of the best pets stores in the world), and splurged on the Z-Ridge Natural Edible Dental Chew Bone by Zukes. I liked the fact that this product was made with carrots and other all natural ingredients. The chlorophyll helps keep my dog Champ’s breath sweet and fresh, and the beta carotene I am sure does something good too. Plus, I tasted the bone myself in the store first. I personally found the flavor a bit overwhelming of carrots, and a bit sweet, but certainly not offensive. Important lesson to be learned here. When considering a treat, bone or dental chew that cost over $4 like the Zuke’s product, bring your dog into the store with you. What may taste fine to you, well simply isn’t the “carrot on a stick” for your pet. I was hoping for a bone that would scape and clean my dog’s teeth, not my wallet.